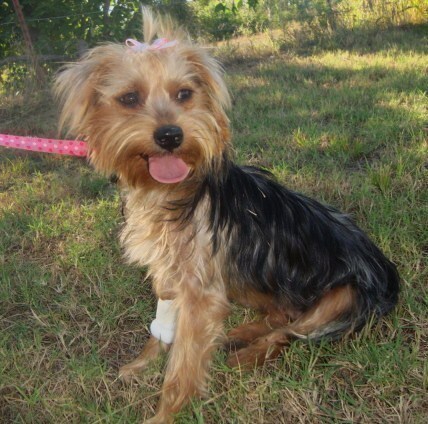 Cadence is a one year old black & tan yorkshire terrier. Cadence we rescued from the shelter and is a beautiful yorki. She is great with anyone she meets and has a unique and wonderful personality. Cadence is definitely a cuddle bug and loves to cuddle on the couch. She is a very laid back dog but still at the same time enjoys playing with her toys. Cadence is great with all people, good with other dogs, children, and is crate trained. She comes up to date on shots, spayed, micro chipped, and current on heartworm preventative. Cadence is a very sweet dog that is looking for her forever home where she will be given tons of love and affection. If one is interested in adopting Cadence please fill out a application by clicking the link at the top of her bio. CADENCE’S ADOPTION FEE: $150.00 Reviewed & Updated: 09-11-2010 Cadence is exclusively fed Natural Balance Ultra Premium Dog Food!